A migrant labourer allegedly set a 12-year-old girl afire at her home in the city’s Nichi Mangli locality on Thursday evening reportedly to avenge his cousin’s death. The victim, Soni Kumari, succumbed to her burn injuries at the Civil Hospital on Friday. Soni’s family members claimed the suspect, Mitra Prasad, 45, who is employed as a security guard at a nearby factory, poured kerosene oil on the girl and later set her on fire. He then fled the scene and has not been arrested yet. The police has registered a case of murder against Kumar at the Sahnewal police station. He was arrested and is presently in jail. However, police officials investigating the incident have not ruled out the possibility of the girl having set herself on fire. “We thoroughly searched her home on Thursday night and found a ‘dupatta’ (long scarf) was tied to the ceiling. So there could be a possibility that the girl tried to commit suicide by hanging herself but later set herself on fire. But things will become clear after we get the postmortem report tomorrow morning,” said Sahnewal police station officer Inspector Gurcharan Singh. Soni’s mother, Usha, told the cops she had gone to work on Thursday evening and had left her daughter alone at home. “At around 6 30 pm yesterday Mitra Prasad barged into my home and poured kerosene on Soni and, after setting her afire, he fled,” she alleged. Usha claimed on April 1 a man named Ram Bihari, who worked at the same factory where Prasad was employed, had come to her home and tried to molest Soni. “Both Bihari and Prasad are cousins. My husband, Rakesh Kumar, arrived home and saved Soni from being molested. Both he and the intruder had a scuffle after which Bihari died. Ever since Prasad was having a grudge against our family and I suspect this was the motive for his action,” she alleged. Additional deputy police commissioner Sushil Kumar said based on Usha’s statement a murder case had been registered against Prasad. “We’re waiting for the postmortem report and the cause of death will be known only after that. Meanwhile Prasad still works at the factory where he is employed and we’ll call him for questioning whenever required”, he added. Even as city residents have been complaining for a long time that substandard material is being used for the recarpeting of roads, a surprise check by officiating Mayor Parveen Bansal has confirmed this fact. Bansal visited the Model Town area today to check the recarpeting of the stretch from the Montgomery chowk to the bus stand flyover. He was shocked to see that substandard material was used by the contractor. “I saw with my eyes that substandard material was being used. When I rubbed my feet on the newly laid road, bitumen started coming out, which confirmed that the contractor, Narinder Kumar, was using substandard material,” he said. Immediately after Bansal reached the spot, Executive Engineer HC Salaria was summoned. He took samples of the material used and sent those for checking to the laboratory at Guru Nanak Dev Engineering College here. “We want to be doubly sure that substandard material was being used. If the report confirms it, we will take strict action against the contractor. We will penalise him and tell him to recarpet the road again,” Bansal said. “The MC officials who were supposed to check the quality of material will face strict action. I want to send a clear signal to contractors and MC officials that I will not tolerate it. It is public money and we will not let it go waste,” he added. Profile: Kahlon started her career in 1954 as a lecturer in English. 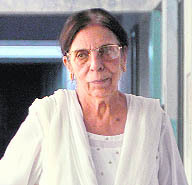 She retired as principal from Guru Nanak Khalsa College for Women, Model Town, in 1986. Since then, she has been serving as the director of Gujjarkhan campus. Recipe for happiness: Hard work, dedication, discipline and above all, devotion. Experiential repertoire: Teaching, in itself, is a very interesting experience. Then and now: Ludhiana has changed a lot. Model Town is now a posh locality. The city has seen a shift in the basic values and it’s not a very wholesome shift. Profile: Comparing his life with that of Jean Henri (Henry) Dunant, Swiss businessman and social activist who founded the Red Cross, would not be out of place. Kumar (75) began his humanitarian service before Partition. Since 1983, he has been running the Nishkam Sewa Ashram. Recipe for happiness: One finds fulfillment in serving the poor and needy at a time when the love of mammon has replaced brotherly love. Lofty goals: No one should die of hunger; the sick should get medicines; illiteracy be stamped out; no one should beg; there should be communal harmony. Profile: A social studies and English teacher, she came across her colleague’s hearing impaired child in early 1960s. She met another such person. This motivated her. The facility began in 1986. Recipe for happiness: See God in fellow beings. Your heart will be full of joy. Experiential repertoire: Each day has blessings. We need to count them. Then and now: Once known for ‘tongas’, it is city of cars. It fares badly in terms of schools for special kids. A day after Ludhiana Tribune highlighted the issue of 17 iron manhole covers going missing mysteriously from the Lajpat Rai road here during work on laying of interlocking tiles and the alleged sale of these by the contractor concerned, Jagraon municipal council (MC) president Baldev Krishan Dhir reportedly made three councillors, who had raised the issue during a meeting of the civic body some days back, pledge that they would not raise this issue during its monthly general house today. According to sources, just before the meeting was to begin, Dhir took the councillors, Kulwinder Kala, Jatinderpal Rana and Rachpal Singh, to a separate room and appealed to them to pledge not to raise the issue during the general house today. They refused to pledge initially, but when Dhir kept pressurising them, they finally gave in and promised to keep mum during the general house, the sources added. As a result, today’s general house was a dull affair compared to earlier ones, which were usually full of high drama, with allegations and counter-allegations of corruption and fund misuse by councillors flying thick and fast. Neither was any resolution passed, nor was any serious issue raised during today’s meeting, which eventually concluded within just an hour. After the manhole covers had gone missing, the three councillors had raised the issue before the Deputy Director, Local Bodies, Davinder Singh, during his visit to MC office some time back. At that time, they had alleged that the covers had been illegally sold by the contractor who was awarded the work, in connivance with certain MC officials. Following this, the Deputy Director had assured them of a probe into the matter. Till now, a probe had not been initiated. 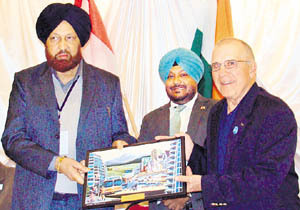 Enjoying the status of a sister city of Abbotsford remains a dream for Ludhiana. For, a delegation of the municipal corporation, which is presently on a visit to British Columbia in this connection, was unable to present their case to the satisfaction of their hosts during a meeting yesterday. Besides making the office-bearers of the Abbotsford civic body, led by Mayor George W Peary, wait for some time, as the team from Ludhiana led by city Mayor Hakam Singh Gyaspura reached late at the venue, the team was not able to get a memorandum of understanding signed. Contrary to expectations, the delegation failed to impress upon the hosts the objective of the sister city programme to provide an umbrella of support and to promote good relations between the two cities. However, Abbotsford did not close doors for further talks on cooperation. A few days ago, a high-level delegation from Abbotsford had offered to adopt a few cities in Punjab under the sister city programme, which was aimed at providing an umbrella of support and promoting good relations. Abbotsford also intended to provide a forum for cultural, economic and educational exchange and to encourage friendship, cooperation and understanding. Ludhianvis will have to wait for some more time, if at all, another meeting takes place. Shockingly, the delegation from Ludhiana could not even follow international protocol, which put the coordinators in an embarrassing situation. Additional Commissioner Kuldeep Singh and Gurdeep Singh Grewal, an office-bearer of a Canada-based publishing house, were left red-faced when the hosts, including the Mayor, had to wait for latecomers. Admitting that nothing concrete had come out of the meetings, Grewal and Abbotsford Deputy Mayor Moe Gill said the process could be resumed at a later stage. “Though nothing significant has come out, we appreciate the initiative taken by Kuldeep. We discussed major problems in Ludhiana, including traffic chaos and solid waste disposal, and have given our suggestions,” they said. Besides Giaspura and Kuldeep, other members of the delegation were Deputy Mayor Sunita Aggarwal, Parminder Mehta, Gurdeep Singh Neetu, Harbhajan Singh Dang and Mandeep Kaur Sandhu. A youth, working as a truck driver and hailing from nearby Sherpur Kalan village died under mysterious circumstances at Bijnaur town of Uttar Pradesh on September 28 night. The victim has been identified as Balwant Singh, alias Bant (22), and is survived by his wife and a two-year-old son. The truck owner, Avtar Singh, with whom he used to work, brought the body to the village this morning. The truck owner, who hails from same village, informed family members that Balwant was ill and died of high fever. He also claimed that he had admitted Balwant at a private hospital in Bijnaur where he died. The family members, on the other hand, have termed the claims of Avtar Singh false and suspected foul play in the incident. “My son was fine when he left home. Moreover, the truck owner never informed us that he is ill. If the condition was so bad as claimed by Avtar, he should have at least informed us,” said Gurdass Singh, father of the deceased. According to the family members, there were some visible marks of injuries on Balwant’s body. Gurdass demanded the police to conduct a thorough inquiry and bring the culprit to book. Meanwhile, the police has handed over the body to the family members after conducting a post-mortem at the Civil Hospital, Jagraon. When contacted, SHO Sadar police station, Rachpal Singh, said the police had recorded statements of both sides and investigation was on. Though no case was registered till the filing of this report. According to Rachpal Singh, the police is waiting for the post-mortem report and a case would be registered after receiving the report and verifying claims of both sides. SSP Ludhiana (rural) Police Amar Singh Chahal today assured that an impartial inquiry would be conducted into the case in which eight persons, who had come in support of a 92-year-old woman of Agwar Gujran locality, when her tenant allegedly tried to possess the house owned by her, were booked by the police for allegedly attacking the tenant. The SSP gave this assurance following a delegation of area residents led by district planning board chairman Bhag Singh Mallha met him yesterday evening and brought to his notice that tenant Surinder Singh had lodged a false complaint against eight area residents, who had in fact come to help Maya Devi when the tenant allegedly tried to possess the house illegally. According to area residents, Surinder Singh has been staying at Maya Devi’s house as a tenant since five years. Last Wednesday, Surinder had an argument with Maya Devi when she asked him to pay the rent, which he had not paid since many months. Following this, Surinder allegedly misbehaved with Maya Devi and when some nearby residents came to help her, Surinder injured him and got admitted to a hospital. After this, the area residents met the SSP and presented their case before him. The SSP marked an inquiry into the matter. On the final day of the four-day Panjab University Youth and Heritage Festival of Zone A, Punjab heritage came alive on the stage at Arya College today. Traditional songs like suhag, ghori, lami haik song and sithnian portrayed the celebrations connected with marriage. Girl students participated enthusiastically in the traditional art and craft items like embroidery, pakhi designing, crochet work, knitting and mehandi. Such competitions help students to be in touch with the traditional skills. In the evening session, audience were spellbound witnessing traditional dances, folk instruments and folk orchestra. In the second session, Hira Singh Gabria was the chief guest, who announced Rs 1 lakh grant to the college. In the third session, the chief guest was Aran Thapar, managing director, Amar Sons, Ludhiana, and the guest of honour was Sardar Jagdeep Singh Jassowal (ex MLA) and chairman, Vishav Punjabi Cultural Academy. Results: Ladies traditional and ritual songs: AS Khanna College, Khanna; Guru Nanak National College, Doraha; SCD Government College, Ludhiana. Individual prizes: Asween Kohli, AS College, Khanna; Sandeep Kaur, Guru Nanak National College and Rajwinder Kaur, SCD Govt College, Ludhiana; Bhanu Sood, Arya College, Ludhiana. Kavishri: SCD Govt College, Ludhiana; GGN Khalsa College, Ludhiana; GNN College, Doraha. Individual prizes: Jagsir Singh, SCD Govt College, Ludhiana; Prabhjot Kaur, Guru Nanak National College, Doraha; Harpreet Singh, GGN College, Ludhiana. 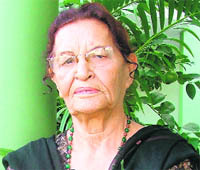 Kali: GNN College, Doraha; GGN Khalsa College, Ludhiana; Arya College, Ludhiana. Vaar: SCD Government College, Ludhiana; Gobindgarh Public College, Khanna. Individual prizes: Jagsir Singh, SCD Govt College, Ludhiana; Satveer Singh, SCD Govt College, Ludhiana; Karanveer, Gobindgarh Public College, Khanna. Several trade union bodies expressed their grief over the death of a noted playwright of the revolutionary drama, Gursharan Singh. In a prayer meeting, held here on Friday to pay tributes to the departed soul, the trade union activists said the revolutionary movement had suffered an irreparable loss. The meeting further expressed solidarity with the textile workers who were agitating to seek their constitutional rights and higher wages. Pandit Shardha Ram Phillauri Welfare Society celebrated the 174th birth anniversary of the creator of the famous Hindu hymn (Aarti) "Om Jai Jagdish Hare" in Krishna Mandir in Model Town here on Friday. Former minister Malkiat Singh Dakha was the chief guest in the function. Chairman of the society, Krishan Kumar Bawa, said the saint, philosopher and author had made an immense contribution to the society by creating the hymn that was recited by followers of Hindu religion across the world. The ongoing chain hunger strike by the Medical Laboratory Technicians Association in support of their pending demands entered its sixth day today. Today, a batch of five activists from district Faridkot observed hunger strike. The association is demanding regularisation of contractual employees, risk allowance, rent-free accommodation and removal of anomalies in pay scales. NREGA employees continued to protest at the Deputy Commissioner's office here on Friday for the fourth day in succession against indifferent attitude of the administration and denial of justice to the employees. 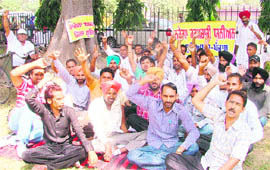 NREGA Employees Union president Jaswinder Singhsaid the authorities were asleep while the employees were suffering. The workers under NREGA scheme were paid their wages within 15 days while those employed under the same scheme were denied salaries for months together, he said. He added that extra workload was put on the employees by making them work in dozen or more villages in violation of the provisions of act governing the employment scheme. Jobless veterinary doctors took out a protest march from Veterinary College to the deputy commissioner’s office today to submit a memorandum. They urged the government to fill the post of rural veterinary officers under the zila parishad at the earliest. They raised slogans, burnt an effigy and raised anti-government slogans for 30 minutes. Doctors pulled cycle rickshaws as a mark of protest. Junior students of Guru Angad Dev Veterinary and Animal Sciences University (GADVASU) re-scheduled their classes to join the protest. “We have paid huge amount as fee, studied hard, obtained good marks, but for what? We are still struggling for job. The government stand is unacceptable,” said a girl while pulling the rickshaw. Punjabi singer and actor Harbhajan Mann reserves four days every month to interact with youth on social and cultural issues and detests violence and vulgar songs. Harbhajan visited Ramgarhia Girls College, Miller Ganj, today. He not only interacted with college students, but also danced to the tunes of famous Punjabi songs sung by him. Harbhajan claimed that his movie “Yarra-o-Dildara” is running successfully and his upcoming music album “Satrangi Peeng-2” is ready for release. Harbhajan Maan also inaugurated a weeklong NSS camp. Students of the dance department mesmerised the audience with their spectacular performance. College principal Narinder Kaur Sandhu, Ranjodh Singh and Jagtar Singh, president and the general secretary, respectively, Ramgarhia Educational Council, congratulated the prize winners and encouraged them to excel in the upcoming Inter-Zonal Youth and Heritage Festival. Though the SAD-BJP government has been criticised for its failure to allot residential flats to victims of 1984 anti-Sikh riots or for that matter disbursement of one-time Central grant to them, Chief Minister Parkash Singh Badal yesterday’s announcement of allotting houses such families in the city and Mohali is being seen more as a step to consolidate the vote bank among urban Sikhs in the wake of Assembly elections rather than a genuine intention towards rehabilitation of the migrant Sikh families. While the Danga Peerit Welfare Society, headed by Surjit Singh, who is known for his links with SAD leadership, expressed gratitude to the state government for showing its concern towards the riot-affected families, and issuing directions to the Punjab Urban Planning and Development Authority (PUDA) in this regard. However, the Sikh Migrants Welfare Board, led by Kartar Singh Patna, has slammed the government while alleging that it was just shedding crocodile tears for the riot victims. Surjit Singh said today that the government had conceded long-pending demand of the riot-affected families by directing the PUDA to start allotting residential flats to them in Ludhiana and Mohali. Not only this, the administration has also been directed to regularise the allotment to those who had illegally occupied government houses till March 31, 2011. “At least 1,500 residential houses will thus be allotted to Sikh migrants in the city alone,” he added. 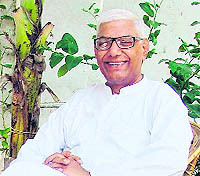 He also hailed the government decision to include grandchildren of riot victims in the red card category to provide benefit of reservation to them in educational institutions as also further extension of 5 per cent reservation in residential schemes of the PUDA and Improvement Trusts for the Sikh migrants for a period of five years. Kartar Singh Patna, however, lambasted the Badal government for giving yet another lollypop to the riot-affected families. “Now that the Assembly elections are nearing, the Badal government is again out to pay lip service to the riot victims as the announcements made by him will not be translate into reality,” he added. He ridiculed the decision of regularising possession of unauthorised, and even ineligible occupants in government flats while indicating that this “unlawful” act will be challenged in a court of law. Akali Dal (Delhi) state president Jaswinder Singh Baliawal has accused the state government of failing to build and operate godowns for storing foodgrain. He has alleged that the state government has failed to introduce a financial accounting package despite the Centre’s request. Addressing a press conference here today, Baliawal said paddy procurement would start tomorrow. “We expect 115 lakh tonnes of paddy to reach mandis,” he said. He said the Centre had decided in 2008 to build godowns for storing foodgrain under a public-private partnership, to be managed by the state government. “The state government gave this responsibility to Pungrain. Its General Manager invited tenders for 90 sites for the construction of godowns on a build-operate-transfer basis in September 2009,” he added. “None of these were approved. Fresh tenders were invited for 63 sites in July 2010. Nothing further happened. The government invited tenders for 24 sites in April 2011. Nothing has been done,” Baliawal rued.